Alkan Air is partnered with Yukon College to offer one year or 30 credits toward the school’s two-year Aviation Management diploma program. The majority of ground school courses occur during the evening at Alkan Air and flight training must take place during daylight hours (exception is night time flight training). Alkan Air itself provides Private Pilot and Commercial Pilot License training. The operation provides a unique environment to learn in a northern climate, with access to an international airport and gravel strips in remote areas. Canadian Flight Centre opened in 1979 at B.C.’s Boundary Bay Airport, near Vancouver, and became one of the first flight schools to specialize in instrument flying and other advanced training. CFC has trained thousands of pilots and today its students come from six continents (Antarctica excluded). Kamloops proximity to the mountains provides the opportunity for mountain checkouts. Canadian Helicopters operates its flight school under the name HNZ Topflight, providing training programs to both company pilots and external clients. The school traces its origins to 1951 when it was known as the Canadian Helicopters School of Advanced Flight Training. Canadian Helicopters also provides ground based and simulation instruction for Royal Canadian Air Force pilots as a subcontractor to Allied Wings Flight Training Services. This facility is located at the Canada Wings Aviation Training Centre near Portage La Prairie, Manitoba. Other clients include the United States Navy Special Forces, Royal Canadian Mounted Police and the Royal Danish Air Force. Chinook Helicopters began training operations in 1982 at the Abbotsford Airport, from where it continues to operate. The Abbotsford area is well suited for year-round helicopter training. Chinook utilizes the expansive Fraser Valley for all initial flight exercises, and the Coastal Mountain Range for intermediate and advanced exercises. Due to the extensive commercial helicopter activity in southwestern British Columbia, most approaches and landings are to actual industry helipads. Coastal Pacific Aviation, located at Abbotsford Airport, partners with The University of the Fraser Valley to combine a diploma or degree together with a Commercial Pilot’s Licence with multi-engine and instrument rating. Its programs also include Seaplane Endorsement, Private Pilot Licence, Commercial Pilot Licence, Multi-Engine Rating, Instrument Rating, Night Rating and Instructor Rating. Glacier Air, operating from Squamish Municipal Airport, trains within the Sea-to-Sky corridor from Vancouver to Whistler, specializing in mountain training for fixed- and rotary-wing aircraft. Glacier also offers survival ground school, which includes studies in weather, flight techniques, effects of density altitude, emergencies, route planning and aircraft preparation, and survival gear. Ocean Air training specializes in seaplanes for both commercial and private licenses, helping more than 300 pilots earn their Canadian Seaplane Rating since 2002. With Transport Canada Floatplane/Seaplane Endorsement training, the company provides 15- and 50-hour programs amid the Gulf Islands with close proximity to Vancouver. Okanagan Mountain Helicopters started as a helicopter flight training school in 2003. Its courses are designed to address commercial helicopter companies with a range of operational flying. Its facility at Kelowna International Airport also introduces students to controlled radio procedures, multiple training locations for confined areas and mountain flying introduction within a control zone, and the best blend of controlled and uncontrolled practice areas. The Pacific Flying Club (PFC) was formed in 1965 as the Canadian Pacific Airlines Employees Flying Club. Students train at Boundary Bay Airport, where it has been located since 1985. The not-for-profit organization has a fleet of 27 aircraft and three simulators. It is a partner with the British Columbia Institute of Technology’s flight program. The Victoria Flying Club (VFC) has been training professional pilots since 1946. Located at Victoria International Airport, VFC provides a range of flight environments on a standardized fleet of Cessna 172SP Model aircraft. VFC has partnered with the University of Victoria to offer a Diploma in Business Administration – Aviation Option program. Absolute Aviation is a flight training and aircraft maintenance facility, largely serving students from Edmonton and central Alberta. Absolute operates out of Wetaskiwin Regional Airport in close proximity to Edmonton International. The school operates in both uncontrolled and controlled airspace with a fleet including Cessna 172 aircraft and also the Citabria 7ECA for single engine training and the PA-60 for multi-engine training. The Calgary Flight Training Centre (CFTC) provides training for professional and private pilots. It is located in a new faciliy that is still within the Olds-Disdury Airport, which itself is in an uncontrolled airspace. The school operates a fleet of new aircraft with G500 Glass Cockpit trainers. The Canadian Centre for Unmanned Vehicle Systems (CCUVS) offers a 1.5-day Unmanned Vehicle Systems ground school course to both civil and commercial operators, covering topics like aerodynamics, air law and regulations, weather, and aviation chart and flight supplements. Canadian Unmanned Inc. is the exclusive UAV training provider of CCUVS. Canadian Unmanned offers a 2 1/2 day air ground school course that is compliant with training requirements set out by Transport Canada for operators of small UAVs under 25 kg in weight for visual line of sight (VLOS) operations. Centennial Flight Centre, in operation since 1967, is located at Villeneuve Airport, approximately 20 kilometres northwest of Edmonton. It provides training for Recreational Pilot Permit, Private Pilot Licence, Commercial Pilot Licence, Multi-Engine and Instrument Rating. Centennial maintains a fleet of four Cessna 172Ms (primary trainer), one Cessna 172S, one Piper Arrow and one Piper Seneca I.
Edmonton Flying Club, home of the Edmonton Flight College, is located just west of Edmonton, operating out of Parkland Airport in Parkland County. Originally founded in 1927 as the Edmonton and Northern Alberta Aero Club, the club’s first president was Canadian World War 1 flying ace, Wilfrid R. May. Today, the Edmonton Flying Club is a member-owned organization with a diverse fleet of aircraft and providing flight training at all levels from recreational pilots to Commercial Multi-Instrument rated, career-ready pilots. PilotExams.com provides practice exams for Canadian pilots and student pilots. Originally created by a group of student pilots, PilotExams now develops exams with flight instructors and commercial pilots across Canada. They write thousands of practice questions focuses on Transport Canada examinations for all levels flying, whether seeking a Recreational Permit or looking at aviation as a career. Pilot Exams recently released the INRAT and AIRAT/AIRAF exams. Mountain View Helicopters (MVH) has trained pilots for commercial or private helicopter licences from its Springbank Airport location since 1995, near Calgary International. MVH is able to provide flying weather found on the prairies and also proximity to mountains. It is a commercial operator and able to design courses to develop skills sought by other operators. Founded in 1946, Mitchinson today is located in its own hangar at the Saskatoon John G. Diefenbaker International Airport. This allows students to fly in an ATC-controlled environment, providing experience for flying in larger centres, but without the traffic delays and congestion of a larger airport In 2013, Mitchinson was purchased by professional airline pilots who previously trained at the school. The Brandon Flying Club’s Flight Academy has served the region since 1936. Located at Brandon Municipal Airport, just outside of Winnipeg, BFA offers a continuous ground school, as well as Recreational, Private, and Commercial courses. Night VFR Over the Top and Instrument Ratings are also available. Transport Canada Written Recreational, Private, Ultra Light, and Helicopter exams can be completed at the centre as well. Harv’s Air is a family owned and operated flying school that also provides air taxi and aircraft maintenance from two locations, Steinbach and St. Andrews, in the Winnipeg area. In business since 1973, the company offers a range of training from Recreational Pilot Liscence to Airline Transport Licence programs. Founded in 1999, PilotTraining.ca provides online instruction for aviation written examinations. Courses can be used as credit toward the Transport Canada ground-school requirement. The operation is approved to conduct ground schools with Harv’s Air, its parent company. Courses are completed by using multimedia tools such as video, mp3, presentations, animations, web pages, and automatic correcting and referenced practice questions. Prairie Helicopters, which also provides charter helicopter services, describes itself as Manitoba’s only turbine helicopter flight school. Its head office and main hangar are located at the Gimli Airport approximately 45 minutes north of Winnipeg. The operation holds a fleet of Bell 407, Bell 206L3 and Bell 206B helicopters. Winnipeg Aviation has provided pilot training for more than 45 years. The school is based at St. Andrews Airport, 15 kilometres outside of Winnipeg. This provides for proximity to an international airport and uncontrolled grass strips. St. Andrews holds three runways for training with and without crosswinds. Altohelix is partnered with Toronto Airways to run full time UAV ground school and flight training with units based in two Greater Toronto locations, including Markham and Oshawa. It provides training required for the Transport Canada Special Flight Operation Certificate (SFOC) and Pilot Permits, leveraging instructors who hold Air Transport Pilot Licenses with Flight Instructor rating. Altohelix provides instruction, examination and certification for Transport Canada Knowledge Requirements for Pilots of Unmanned Air Vehicle Systems UAV 25 kg or less, Operating within Visual Line of Sight and Restricted Operator Certificate with Aeronautical Qualification. AeroCourse has provided aviation ground school training courses for more than 20 years. This includes online programs and IFR and ATPL/IATRA seminars with instruction and practical course materials. Its courses are offered in most major Canadian cities, while offering customized programs to groups upon request. The Brampton Flight Centre (BFC) has training pilots since 1946. Located close to Toronto Pearson International Airport, BFC teaches students to fly in controlled and uncontrolled environments. BFC is controlled by the Brampton Flying Club, which owns its airport that covers almost 240 acres. It provides a one-year Professional Pilot Diploma program as a registered Private Career College, as well as industry partnerships with Air Georgian, Jazz and Porter. As one of the oldest flight training schools in Canada, the Brantford Flight Centre (BFC) has been providing quality flight training in Brantford, Ontario since 1929. Its instructors hold a vast history of experience from the aviation industry, offering students extensive knowledge of the Airline, Corporate and Instructor fields. Located in uncontrolled airspace, BFC allows students to avoid costly delays due to airspace congestion. For experience in control zones, a short 10-minute flight allows access to three nearby international airports. As a Private Career College, the Brantford Flight Centre is building upon its flight-training legacy with its new post-secondary, 14-month Brantford Aviation College program, which launched in April 2018. Diamond Flight Centre has been training pilots at the London International Airport since 2009 and, as a registered Private Career College (PCC) in the province of Ontario, holds a full-time staff of 16 certified flight instructors. The school also holds a fleet of 10 training aircraft manufactured in London, Ontario, by Diamond Aircraft, which develops aircraft like the 2-seat DA20 and the new 7-seat DA62. Durham Flight Centre began operations in 1997 and now provides training, aircraft rentals, and sightseeing services. Located in the Enterprise Airlines buildings on the grounds of Oshawa Municipal Airport, providing access to nearby modern aviation infrastructure. It is a Transport Canada-registered flight training operation and also registered as a Private Career College in Ontario. Genesis Flight College is a registered Private Career College providing a one-year dipoloma program. Located at Collingwood Regional Airport, Genesis owns the real estate and buildings on the field in which it operates. Leveraging its fleet of Diamond DA40 and DA42 aircraft, Genesis runs 100 per cent of its training with glass cockpits with electronic flight information systems. Students are exposed to these systems on the first flight and learn deeper functions in each successive training module. Services include commercial flight training, college diploma program, private pilot training, instrument rating, multi-engine rating, instructor rating, sightseeing flights, and air taxi services. Great Lakes Helicopter is a Transport Canada-approved, Ontario Private Career College, while also offering charters. Based at the Region of Waterloo International Airport, the operation offers training year-round and focuses on both commercial and private licensing. Great Lakes is partnered Conestoga College for a program that provides both a Commercial Helicopter Pilot’s Licence and a diploma. Helicopters Canada for approximately 20 years has provided commercial and private flight training to both domestic and international students. Its training area is situated at the Jack Garland Airport, which provides access to heavily forested areas with lakes and rivers for developing the skills needed for a large sector of the Canadian helicopter industry. Ottawa Aviation Services is a professional flight training and maintenance operation based out of Ottawa International Airport. The operation, registered as a Private Career College in Ontario, provides commercial and private training. The operation provides training with modern glass-cockpit, multi-engine and aerobatic aircraft, and simulators. The Ottawa Flying Club, operating as the Ottawa Flight College (OFC) has been training pilots since 1928. Located at Ottawa MacDonald Cartier International Airport, the Ottawa Flying club offers a controlled zone environment for learning IFR procedures, with access to uncontrolled airports in the area. Established in 1996, the St. Thomas Flight Centre offers flight training from Recreational Pilot Permit through to Commercial Pilot Licence and Multi-Engine Instrument Ratings. The centre holds Private Career College status and operates out of St. Thomas Airport in an uncongested flight training environment. School offices are located in the main terminal building and ground school classes are held on site. The Flight Centre has two additional satellite locations at Chatham airport and London airport. Toronto Airways has been providing flight training services beginning in 1963 from the Buttonville Municipal Airport. In 1998, Toronto Airways purchased Canadian Flight Academy, as a growing flight training provider located at the Oshawa Executive Airport. In 2016, Toronto Airways moved into a new facility at Oshawa Executive Airport. With a full compliment of ground school courses, the training operation’s services allow for a student to obtain either a Private Pilot and Commercial Pilot License. The operation has access to more than 15 training aircraft and two advanced simulators. Spectrum Airways has been training pilots for more than 40 years. The training facility is situated at the heart of Burlington Executive Airport, one of the busiest airparks in Ontario. The airport averages 30 flights on weekdays. Registered as a Private Career College, Spectrum’s training programs include Private Pilot License, Commercial Pilot License, Night Rating, Multi-Engine Rating, Instrument Rating/Multi Instrument Rating and Instructor Rating. Waterloo Wellington Flight Centre (WWFC) is located at the Region of Waterloo International Airport. The training centre is partnered with Conestoga College and the University of Waterloo to offer diploma and degree programs. WWFC also offers a Remotely Piloted Aircraft System (RPAS) course designed to introduce people to regulations, operation and maintenance of UAVs/drones. The course offers customized training up-to-date information based on new regulations from Transport Canada. Air Richelieu is an accredited flight training centre with facilities that include multimedia classrooms and flight preparation rooms. The school is located at St-Hubert Airport, approximately 20 minutes from Montreal, and controlled by the Montreal Flying Club. 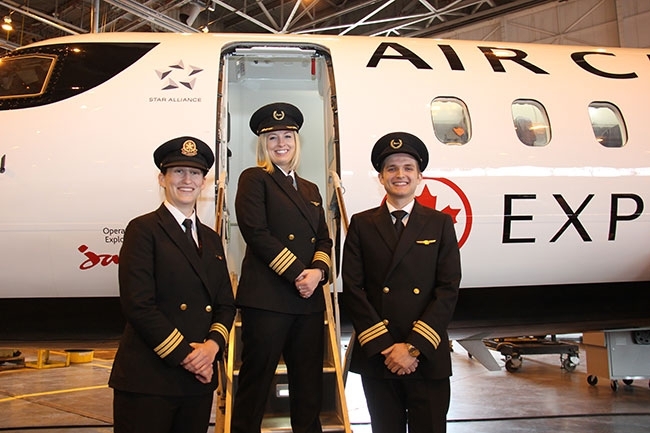 Programs allow students to earn commercial and private pilot licences, along with the multi-engine, instruments and night rating, as well as a diploma recognized by the Ministry of Higher Education, Research and Science of Quebec. Established in the late-1980s, the CQFA offers more than 50 different on-demand aviation courses, providing assistance for a range of training like Accredited Check Pilot, Crew Resource Management, Flight Crew Training, GPS, CFIT Avoidance Training, and Proficiency Checks. Some courses are also available via the Internet. CQFA has been training UAV pilots since 2007, offering a range of courses training for recreational and professional pilots. This includes an introduction to the Canadian regulatory framework, a ground school, several advanced workshops, applied human factors and risk management, in addition to practical courses. Dorval Aviation is a commercial air operator and a flight training centre located at the Montreal International Airport. We operate a diversified fleet of aircraft that can fulfill all of your traveling requirements, or flight training needs. It provides courses from simple introduction to aviation to Commercial Pilot License, as well as an internship program. Dorval Aviation also provides specialized recurrent training courses for commercial air operators, as per Canadian Regulations. Laurentide Aviation has been providing professional flight training since 1946. Based at Les Cedres Aerodrome, an uncontrolled airport, approximately 25 kilometres west of Montreal, Laurentide offers bilingual inflight and ground school instruction, as well as recreational, private and commerical pilot lisence courses. Debert Flight Centre is part of the Truro Flying Club and operates out of Debert Airport, which has been home to the club since 1972. Debert Airport is an uncontrolled air space located less than is less than five minutes flight time from training areas. It has an in-house Designated Flight Test Examiner for private and commercial licenses, so that students do not have to travel to another airport to take their flight test. GFT Aerospace has provided flight training since 1992, evolving from its roots as EVAS Air (Exploits Valley Air Services). Its facility is located at Gander International Airport. The aerospace college provides a fleet of 17 aircraft, including a helicopter, a flight simulator, large classrooms, individual briefing rooms, and a large technical library for students.